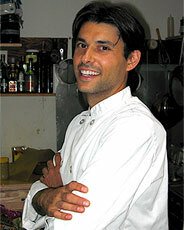 Chef Matteo is one of New York City's finest vegan and raw foods chefs. Chef Matteo's creative and bold entrees, appetizers, and tastings are not only appealing to the palette but are visually and aromatically stimulating to all. 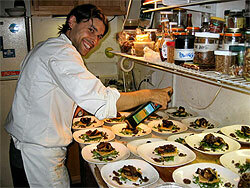 Matteo is the creative force behind the 4 Course Vegan dinner parties, which are all the buzz throughout Williamsburg and Manhattan alike. If Spelt berries, unhulled sesame and nutritional yeast conjure visions of a farm, it's time you visited the heart of Chef Matteo's Williamsburg kitchen. For two years, Matthew "Matteo" Silverman has been hosting "4 Course Vegan" dinner parties using superior raw product and local organic produce. 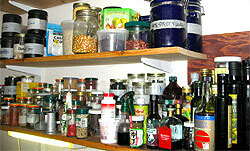 He's also been collaborating on a book "The New 50," creating anti-aging recipes (ReganBooks). This 11-year vegan and Natural Gourmet School graduate defines veganism as "A way of living which seeks to exclude all forms of exploitation of, and cruelty to, animals for food, clothing or any other purpose." Sounds strict but vegans and meat-eaters alike enjoy his innovative approach to eating and socializing; some even travel from New Jersey to partake. The dining room vibe is communal and casual. iTunes stream distant hip-hop; conversations from from science to skiing to Stella McCartney and African travel. We started with two pre-appetizers. Watermellon radish stuffed with cashew cheeze followed by young coconut pad thai with almond butter sauce and sprouted gomasio. "Young coconut is the bomb!" cheered one guest through the hush of focused eaters. 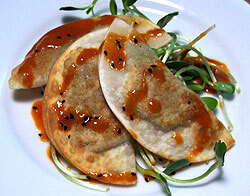 Next came crispy red kuri squash dumplings with ginger ponzu sauce and a spicy kim chi aftertaste, "the way good spicy should." Hot and sour tamarind pineapple soup with oyster mushrooms, beet-pickled mung bean sprouts, and lemongrass bird chile cashew creme fraiche was more like a pungent consomme, but creative nonetheless. 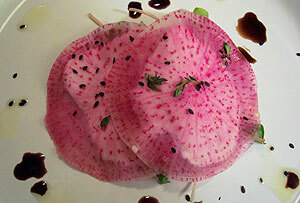 Green papaya, watermelon radish, watercress salad with sprouted black sesame seeds and creamy horseradish citrus dressing followed suit -- tangy with a crunch. Entree: Fall pumpkin and plantain coconut curry with grilled okra stalks, and spicy peanut-mint chutney. Savory and delicious, it was true gourmet. Late-harvest peach and Thai basil strudel with chocolate walnut sauce and sweet kaffir lime cream sealed the deal. Flaky with a slightly complex flavor, it hqad just the right touch of bitter-sweet and peachy nuggets. Two hours later, "4CourseVegan" had unexpectedly become seven courses. Pulling back the kitchen curtain and joining us for a glass of wine, Matteo capped off the evening thus: "I like people not knowing what coming. It's my passion and love and that's all that matters." Dinner parties are open to all; $40. No alcohol provided; BYOB encouraged.